A nuclear explosion occurs as a result of the rapid release of energy from an intentionally high-speed nuclear reaction. The driving reaction may be nuclear fission, nuclear fusion or a combination of the two. All nuclear explosions produce nuclear radiation and radioactive debris that can produce devastating and long-lived effects in the local environment. What are the effects of nuclear explosions? The dominant effects of a nuclear explosion (the blast and thermal radiation) are the same physical mechanisms as produced by conventional explosives; however, the energy produced by a nuclear explosive is millions of times more and the temperatures reached are in the order of tens of millions of degrees Celsius. Nuclear weapons are quite different from regular weapons because of the huge amount of explosive and thermal energy they can produce. Also, the devastating impact of the explosion does not stop after the initial blast, as with regular explosives. A cloud of nuclear radiation travels from the epicentre of the explosion, causing widespread impacts on both flora and fauna even after the pressure and heat waves have passed. The radiation can cause genetic mutation, radiation poisoning, and death. What are the types of nuclear explosions tests? Nuclear explosion tests have historically been classified into categories reflecting the medium or location of the test: atmospheric, underwater and underground. Atmospheric test explosions take place in or above the atmosphere. Generally, these have occurred as devices detonated on towers, balloons, barges, islands or dropped from airplanes. A limited number of high altitude nuclear explosions have also been conducted, generally fired from rockets. Nuclear explosions which are close enough to the ground to draw dirt and debris into their mushroom cloud can generate large amounts of nuclear fallout due to irradiation of the debris. High altitude nuclear explosions can generate an electromagnetic pulse (EMP), and charged particles resulting from the blast can cross hemispheres to create an auroral display. Underwater test explosions have usually been conducted to evaluate the effects of nuclear weapons against naval vessels (such as in Operation Crossroads,near Bikini Atoll in the South Pacific), or to evaluate potential sea-based nuclear weapons (such as nuclear torpedoes or depth-charges). Underwater tests close to the surface can disperse large amounts of radioactive water and steam, contaminating nearby ships or structures. Underground test explosions are nuclear tests which are conducted at varying depths under the surface of the earth. Underground nuclear testing made up the majority of nuclear tests by the United States and the Soviet Union during the Cold War. When the explosion is fully contained, underground nuclear testing emits a negligible amount of radioactive fallout. However, underground nuclear tests can 'vent' to the surface, producing considerable amounts of radioactive debris as a consequence. Nuclear tests are also often categorized by the purpose of the test itself. Tests which are designed to garner information about if and how the weapons work are called weapons related tests, while tests designed to gain information about the effects of the weapons on structures or organisms are known as weapons effects tests. Nuclear-weapons-related testing which purposely results in no yield is known as subcritical testing, referring to the lack of a creation of a critical mass of fissile material. Additionally, there have been simulations of nuclear tests using conventional explosives. The Australian Government is fully committed to realising a world free of nuclear weapons and sees entry-into-force of the Comprehensive Nuclear-Test-Ban Treaty (CTBT) as an important step to limit the further development and proliferation of nuclear weapons. Australia signed the Comprehensive Nuclear-Test-Ban Treaty (CTBT) in 1996 and ratified in 1998 through the Comprehensive Nuclear Test-Ban Treaty Act 1998. State Signatories to the CTBT have committed to abstain completely from conducting or participating in any nuclear weapons test or any other nuclear explosion. In order to verify compliance with the Treaty, the CTBT mandates the establishment of a verification regime. Part of this verification regime is an International Monitoring System (IMS) comprising seismic, infrasound, hydroacoustic and radionuclide monitoring facilities supported by the International Data Centre (IDC) at the CTBT Organization (CTBTO) in Vienna. When completed, the IMS will consist of 337 monitoring facilities located all over the world, capable of detecting explosions as small as a few hundred tons of TNT anywhere in the world. Currently around 90 per cent of these facilities have been built and are sending data to the IDC in real-time. Since 1945, more than 2000 nuclear tests have been conducted. 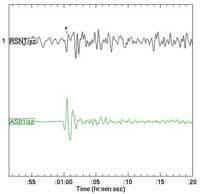 Most of the events recorded on the International Monitoring System network will be earthquakes. 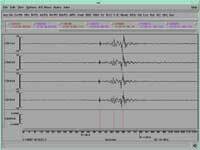 Currently, 100 earthquakes are located each day, along with the occasional recording from mining areas. Active research is being undertaken to discriminate between the different source types being recorded on the network. 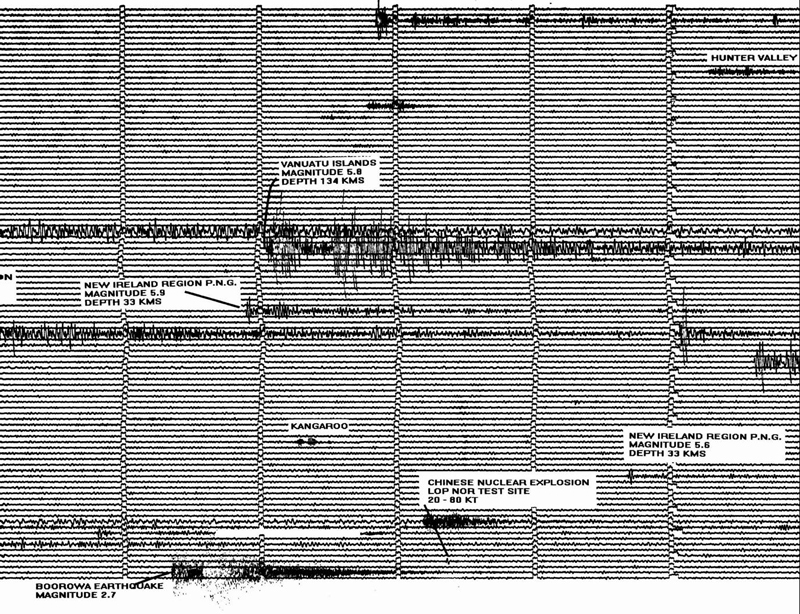 Information on all earthquakes recorded is made available to the seismological community for seismic hazard studies. 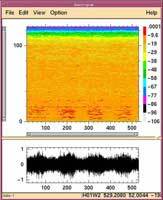 The purpose of the International Monitoring System (IMS) Infrasound network is to detect and provide information on low frequency sound waves generated by a nuclear explosion detonated in the atmosphere or at shallow depths in the ocean. An explosion will produce sound waves (atmospheric pressure variations) over a wide range of frequencies. Higher frequencies are rapidly attenuated or absorbed with distance; however very low frequency energy is not so readily absorbed and can be detectable at ranges of thousands of kilometres. 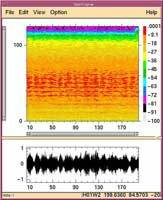 The frequency range of signals IMS infrasound stations are designed to detect is 0.02–4 Hz (cycles per second). 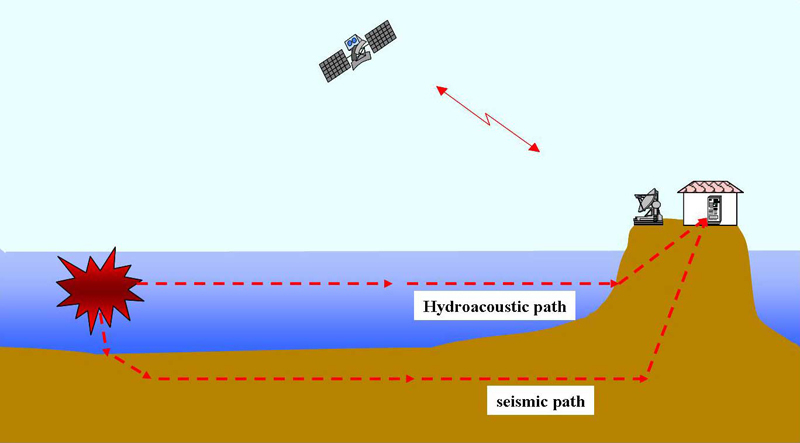 The International Monitoring System (IMS) hydroacoustic network is designed to monitor nuclear explosions in the oceans and at low altitudes above the surface of the oceans. The network consists of 6 hydrophone stations and five 'T-phase' stations that have been strategically located (typically on small islands) to complete the coverage of ocean monitoring. Excellent coverage of the oceans is possible from so few stations as energy propagates very efficiently across the oceans. For example, a few kilogram charge exploded in the Indian Ocean, would be clearly recorded on the hydroacoustic station at Cape Leeuwin, southwest Western Australia. Signals from a number of sources have been observed on the hydrophone stations. These include whale songs, continental and oceanic earthquakes, mid-oceanic volcanic activity, underwater landslides, whales, shipping noise and offshore exploration surveys. What is Geoscience Australia's role in reducing risk to everyday Australians from nuclear explosions? Following a Government decision in 1984, Geoscience Australia actively engages in nuclear monitoring activities on behalf of the Australian Government through the Department of Foreign Affairs and Trade's Australian Safeguards and Non-proliferation Office. Geoscience Australia helps Australia fulfil its obligations under the CTBT by monitoring for nuclear explosions worldwide and by contributing to the development of the CTBT verification regime. Geoscience Australia is currently responsible for the operation and maintenance of 10 of Australia's seismo-acoustic IMS facilities (six seismic stations, three infrasound stations and one hydroacoustic station). 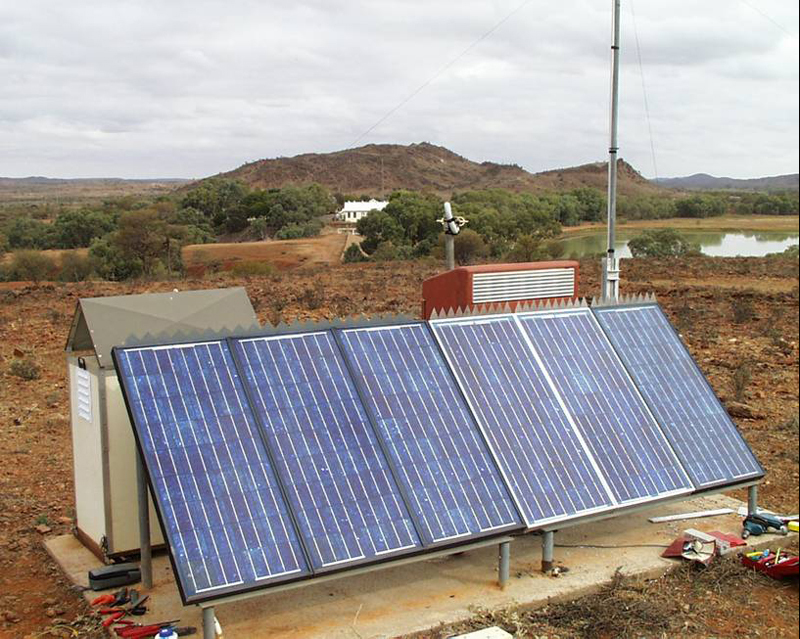 Additionally, Geoscience Australia is in the process of building the final infrasound station to complete Australia's seismo-acoustic IMS network. Construction of this station is expected to be completed within the next two years. Geoscience Australia actively participates in international fora dedicated to technological advances supporting nuclear non-proliferation and verification, and to the use of IMS data for civil and scientific applications. The latter include tsunami-warning and the monitoring of earthquakes and volcanic eruptions. 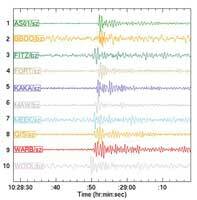 Geoscience Australia monitors data received from the International Monitoring System, the Australian National Seismic Network and other international seismic monitoring networks, such as the Incorporated Research Institutions for Seismology networks, for the characteristic signals of large explosions. If an event of interest is detected, it is evaluated to determine its location, magnitude and its source characteristics (i.e. was it an earthquake or an explosion?). If an event is found to be consistent with a nuclear explosion, Geoscience Australia notifies the Australian Government and provides technical support to any Australian Government response. As part of its commitment to continually improve its capabilities, Geoscience Australia also performs research into new methods to better detect and characterise potential nuclear explosions. 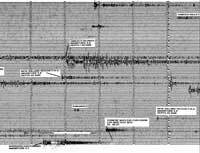 The International Monitoring System (IMS) seismic network is designed to detect and locate underground nuclear explosions with a threshold better than 1kT globally (1 kT is equivalent to a mb 4.0 seismic event occurring in a cratonic region that is well coupled to the earth). The network is composed of 170 seismic stations distributed across the islands and continents of the earth. Fifty of the seismic stations are designated as primary stations and they transmit continuous data to the International Data Centre (IDC) in real time. The remaining 120 stations, known as auxiliary stations, transmit data segments to the IDC upon request. Most of the events recorded on the network will be earthquakes. Currently 100 earthquakes are located each day, along with the occasional recording from mining areas. Active research is being undertaken to discriminate between the different source types being recorded on the network. 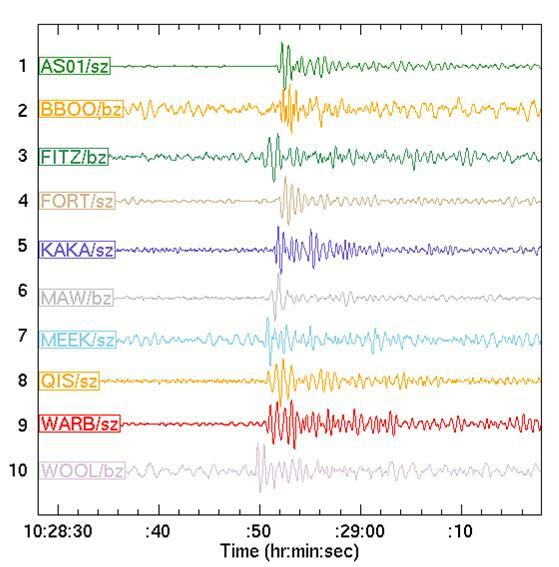 Key discriminants such as body-wave to surface-wave magnitudes; depth; hydroacoustic signatures and P to S amplitude ratios are currently being used to differentiate between earthquakes and nuclear explosions. 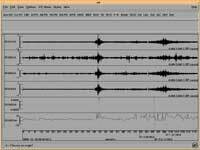 The seismic stations are made up of array and three-component stations. An array station is a group of three or more identical seismic sensors deployed in an optimal configuration ranging in area from a few square kilometres to a few hundred square kilometres. 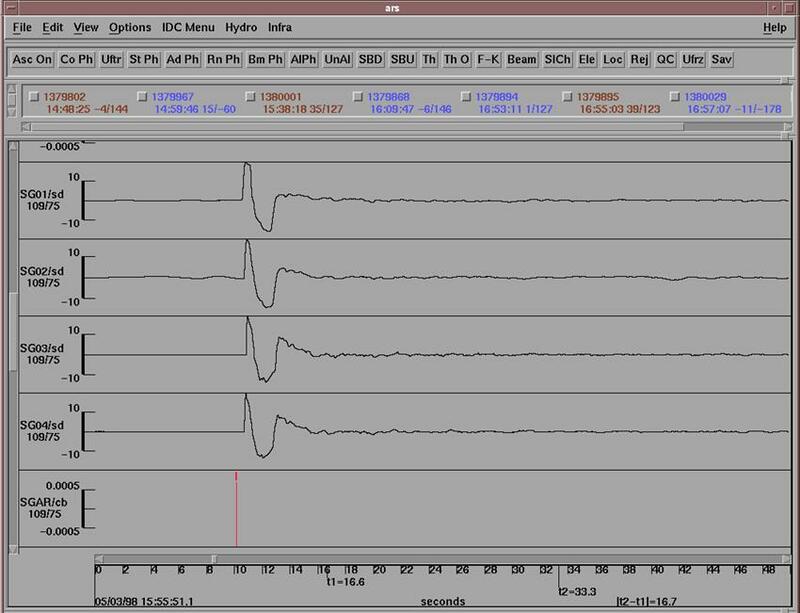 The outputs of the individual sensors can be summed up to increase the amplitude of the event signal relative to the general background noise and as a result they are more sensitive than stations comprised of one sensor alone. The arrival times of signals at the various sensors in an array are used to determine the distance and direction to the seismic source. Three-component stations are made up of three seismic sensors at one site arranged such that one sensor detects vertical motion and the other two detect horizontal motion in the north-south and east-west directions. 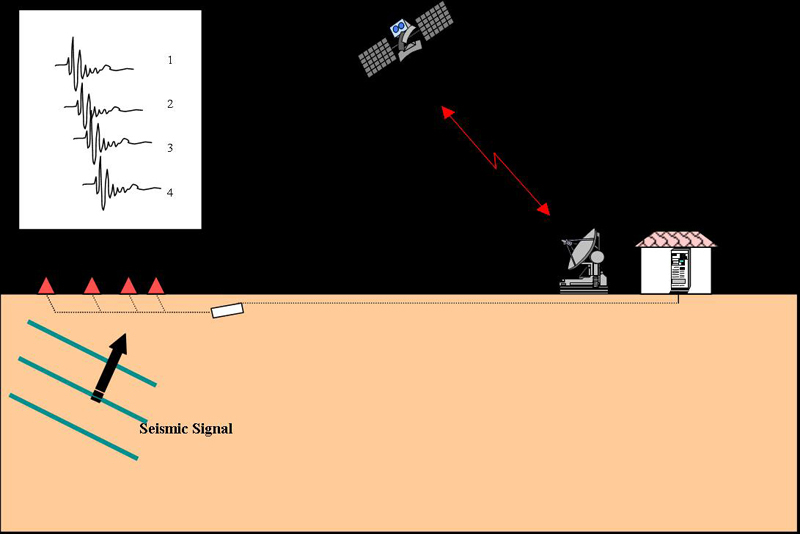 This configuration also allows the station to determine the distance and direction to the seismic source, although the uncertainty is much larger than that calculated by an array. Nuke or earthquake? 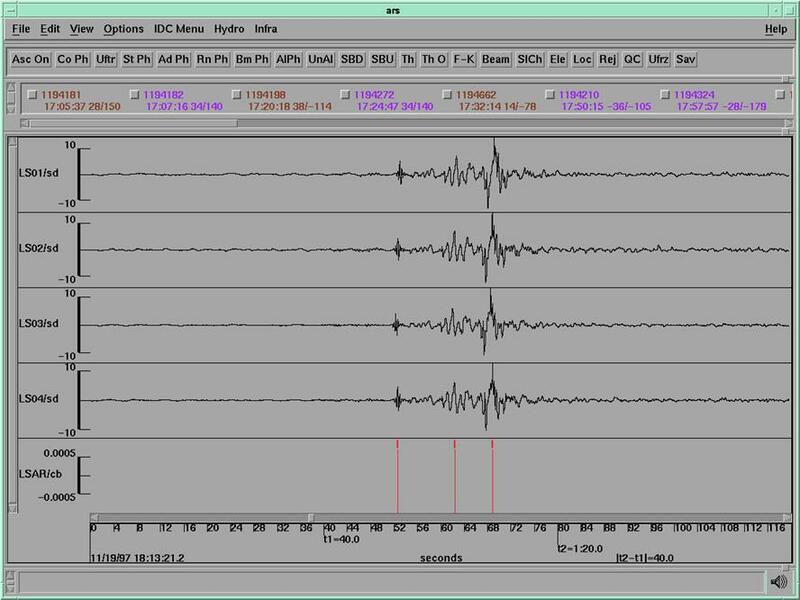 Novaya Zemlya nuclear explosion recorded on RSNT seismograph station in USA and a deep Fiji earthquake recorded on ASAR seismic station in Australia. 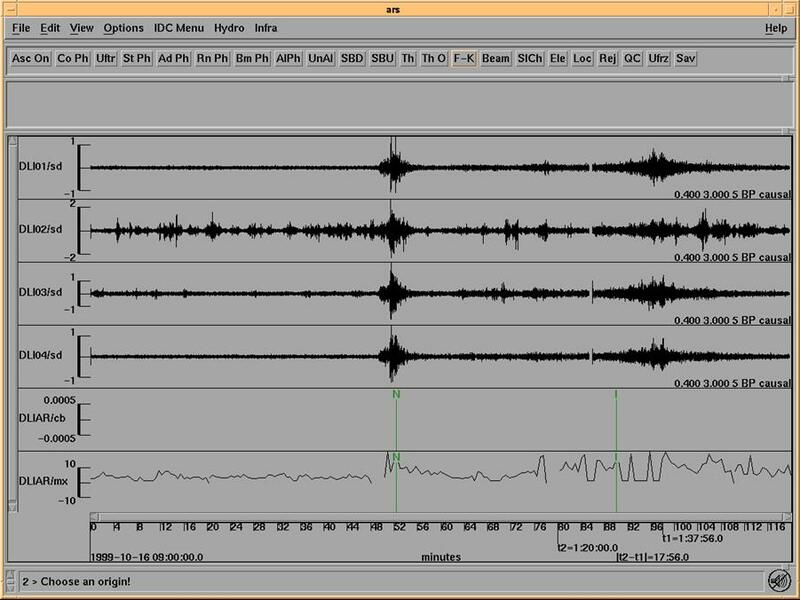 Canberra seismograph recording of 16th August 1995. Note that the significant Lop Nor explosion is swamped by other seismic events on that day. 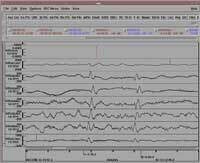 May 28, 1998 Pakistan nuclear explosion recorded on the Australian National Seismograph Network. 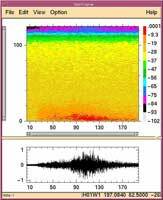 Schematic of a seismic array recording a seismic signal. 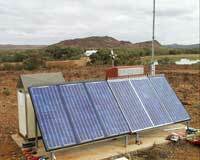 Photograph of CTBT seismic station at Stephens Creek, near Broken Hill, Australia. The purpose of the International Monitoring System (IMS) Infrasound network is to detect and provide information on low frequency sound waves generated by a nuclear explosion detonated in the atmosphere or at shallow depths in the ocean. An explosion will produce sound waves (atmospheric pressure variations) over a wide range of frequencies. Higher frequencies are rapidly attenuated or absorbed with distance; however very low frequency energy is not so readily absorbed and can be detectable at ranges of thousands of kilometres. 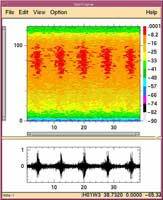 The frequency range of signals IMS infrasound stations are designed to detect is 0.02 - 4 Hz (cycles per second). An infrasound station consists of a number of very sensitive microbarometers. To increase the sensitivity of the station each microbarometer is connected to several radiating pipes with each pipe having small holes (ports) along its length. This arrangement of pipes and inlet ports, commonly called a space filter, averages and largely cancels out pressure variations localised over an area smaller than the filter - such as wind generated turbulence. The maximum dimension of the space filter is limited by the frequency range of the signals of interest and the speed of sound in air. For a normal IMS station the space filter will be limited to a maximum diameter of about 18 metres. If the diameter is larger than this the higher frequency signals of interest would start to cancel out because there will be a significant portion of a signal wavelength being sampled by the space filter at any one instant. 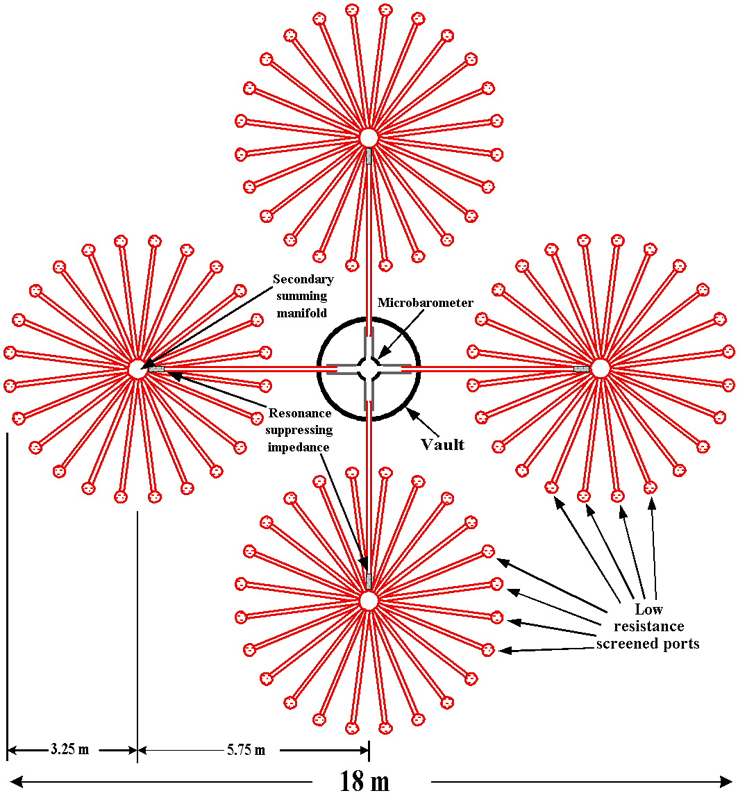 A typical IMS infrasound station will comprise eight microbarometer sensors and associated space filters, four located at the extremities of a lopsided quadrangle with sides of one to two kilometres and an additional four elements clustered at one of the corners. The exact layout of the station is not critical and individual elements are sited to take advantage of local conditions - e.g. topography, isolated patches of forest etc. 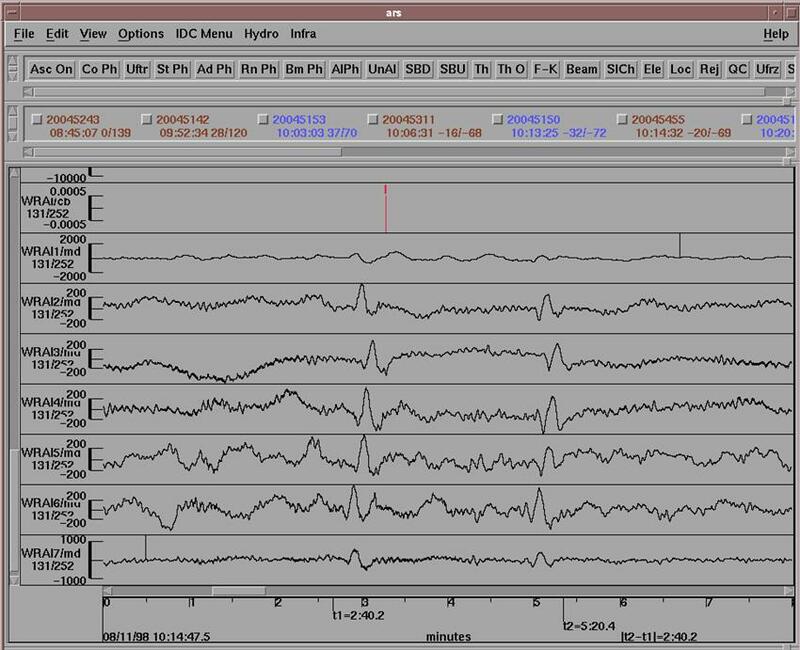 The reason for having multiple sensor elements is first to further increase the signal/noise ratio by using each as an element of a larger array, second to record signals over a wide frequency band to cover the signals of interest and thirdly, to be able to determine the direction from which an incoming infrasound signal arrives. The signal direction can be determined from the difference in time at which the signal arrives at each of the elements. The International Monitoring System (IMS) hydroacoustic network is designed to monitor nuclear explosions in the oceans and at low altitudes above the surface of the oceans. The network consists of 6 hydrophone stations and five ‘T-phase’ stations that have been strategically located (typically on small islands) to complete the coverage of ocean monitoring. Excellent coverage of the oceans is possible from so few stations as energy propagates very efficiently across the oceans by travelling in the sound fixing and ranging channel (SOFAR channel) where attenuation and absorption of energy is minimal. The hydrophone stations themselves are purposely suspended in the SOFAR channel to record very low signal levels. 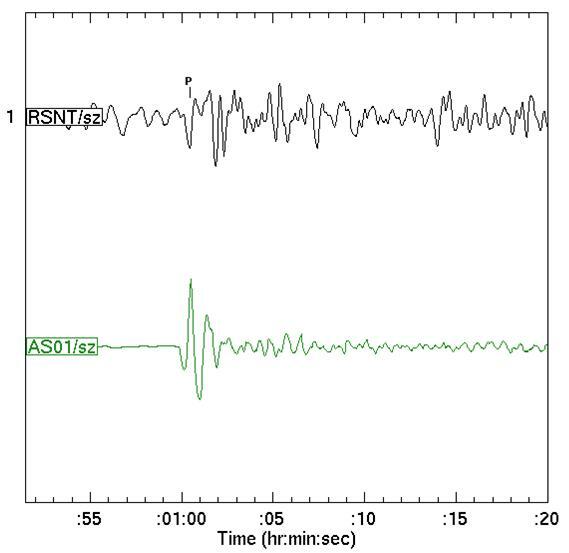 For example a few kilogram charge exploded in the SOFAR channel off (say) South Africa would be clearly recorded on the hydroacoustic station at Cape Leeuwin, southwest Western Australia. An array of three hydrophones suspended in the SOFAR channel from a cable attached to the sea floor. The hydrophones sample vibrations in the water at a high sampling rate of 250 samples/second. A seabed cable that carries power and data between the hydrophone array and a central shore facility. The cable is laid on the sea floor, anchored at some points and buried where necessary. A central shore facility, which houses both electronic and electrical equipment to power the hydrophone array, record the data, reformat and transmit the data via satellite link to the IDC in Vienna. Commonly the data is also provided to the station operator on a separate communications link. converted to seismic energy at the ocean floor boundary close to the source. Data is transmitted via satellite link to the IDC in Vienna. 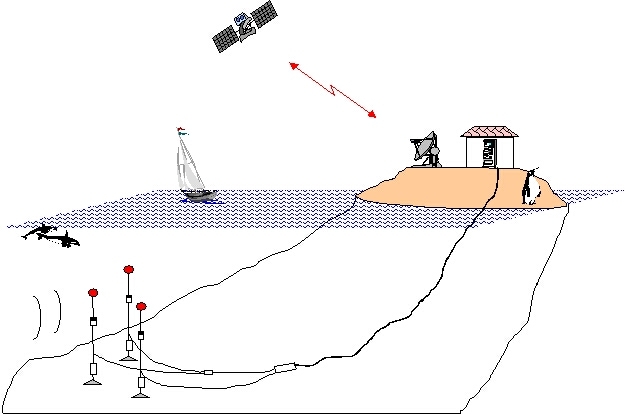 Signals from a number of sources have been observed on the hydrophone stations. These include, inter alia, continental and oceanic earthquakes, mid-oceanic volcanic activity, underwater landslides, whales, shipping noise and offshore exploration surveys. If a nuclear explosion signal was recorded on a hydroacoustic station, distinct signal characteristics would be observed. The recorded signal would contain energy over a wide bandwidth (up to 100Hz), and scalloping in the frequency spectrum that indicates the generation of a bubble pulse at the source. 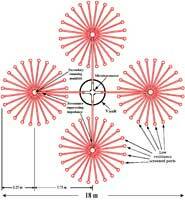 Schematic of a hydrophone station. Schematic of a T-phase station. 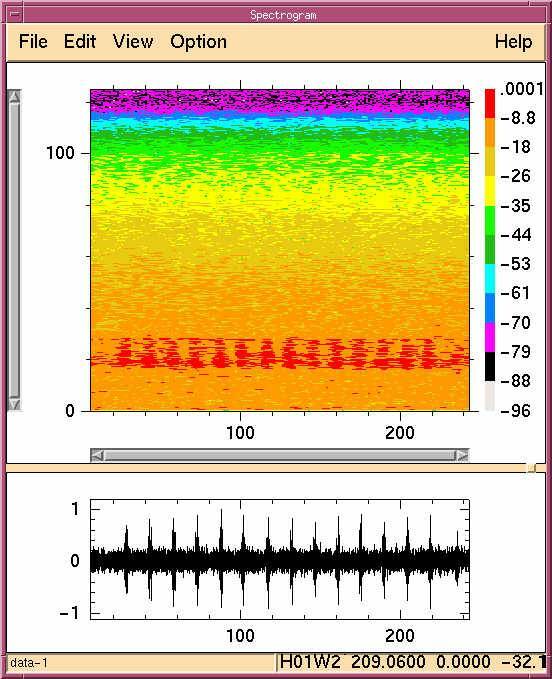 Spectrogram of fin whale calls over a period of 4 minutes recorded at HA01. 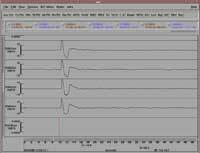 The calls typically begin with strong signal intensities at 23 Hz, and downsweep to 15 Hz. The pulses are separated by approximately 20 seconds. 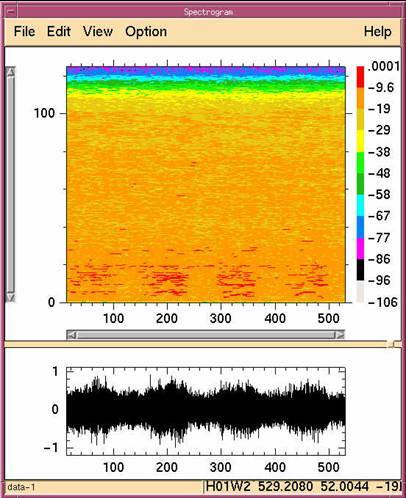 Part of spectrogram of a ship recorded at HA01. The signal intensity lies between 30 Hz and 70 Hz, and has a rhythmic pattern. 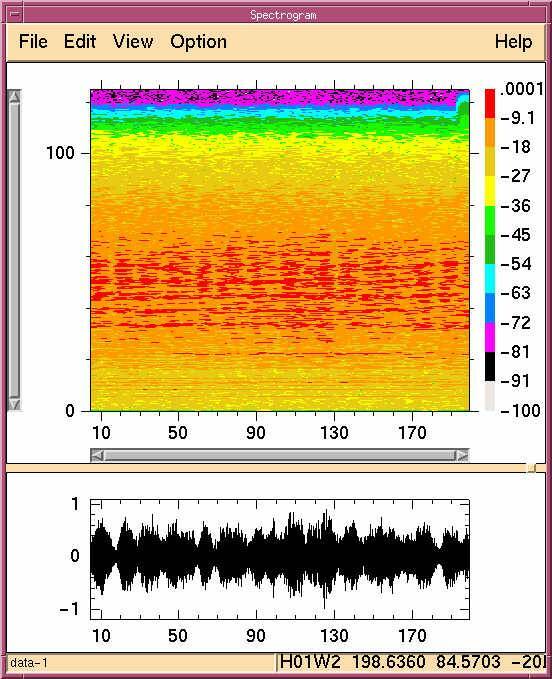 Spectrogram of possible volcano-seismic activity recorded at HA01. The signals are repetitive – 80 seconds long separated by 60 second intervals. Spectrogram of the T-phase from the Ml 5.2 Burakin (WA) earthquake recorded at HA01. The signal has an emergent start, has a spindle-shaped envelope, and all energy is below 30 Hz with highest intensities between 1 Hz and 10 Hz. 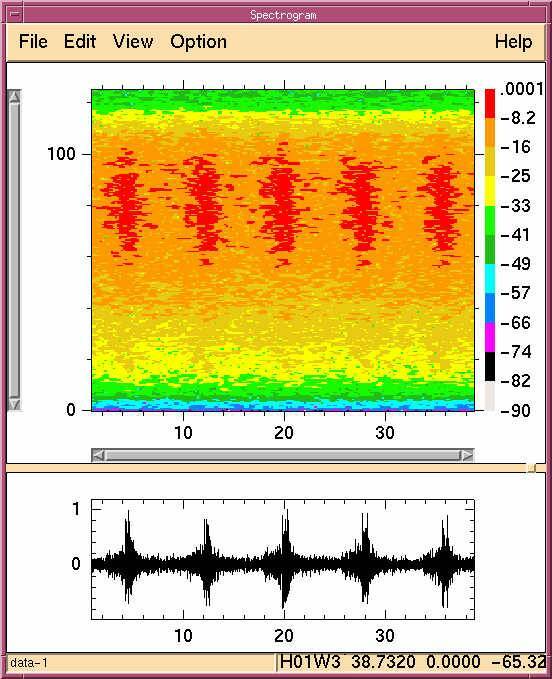 Spectrogram of airgun shots recorded at HA01. Note the high frequency content of the signals.